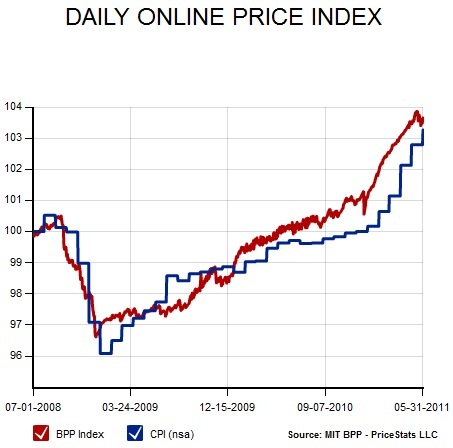 I have mentioned Google’s real time price index before. 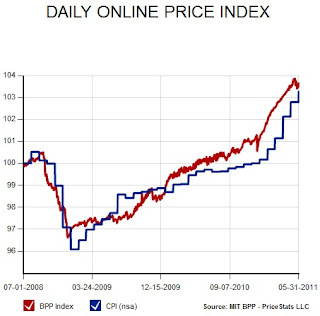 Today I want to go ‘around the grounds’ to see how internet prices and search results are being used as economic indicators. MIT is doing it with their Billion Prices Project. Their index appears to be very similar to Google’s and appears to track the official index in the US well, and a little advanced. That is promising. The Bank of England is using search term frequency as a complement to survey data to provide a better picture of the labour market. 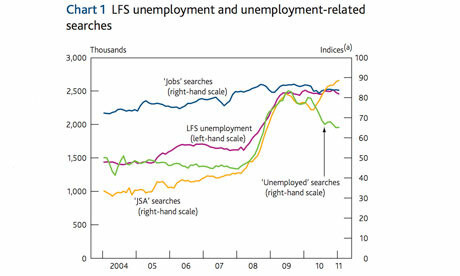 The chart below shows that quite a few search terms provide an indication of conditions in the labour market. Economist bloggers are also very keen on the possibilities that Google search statistics present. Justin Wolfers tests some search terms over at the Freakonomics blog, while a local economic blogger finds a strong correlation between the unemployment rate and the search term ‘piercing pictures’. Yes, correlation does not imply causation. And of course yours truly has used Google search terms to investigate whether Australians believe they are in a housing bubble, with reference to the trends in housing prices and Google searches in the US. Lastly, the academic community is finding that search term frequency a useful tool as a proxy measure for real life frequency of events. We propose, based on the premise that the occurrence of a phenomenon increases the likelihood that people write about it, that the relative frequency of documents discussing a phenomenon can be used to proxy for the corresponding occurrence-frequency. I feel like this is just the tip of the iceberg in terms of the power of the data being collected by Google. And I hope that this valuable data continues to be provided for free to the general public.